Puzzle Agent is a puzzle adventure that sets hapless FBI investigator Nelson Tethers on the trail of a murky Midwest mystery involving an enigmatic eraser factory and a town of kooky Minnesotans. And I’ll admit, from the start, I desperately wanted to love Puzzle Agent. It had all the trappings of something I should adore: interesting visuals, a point-and-click adventure interface, and an explicit focus on puzzles. It’s like the game was designed for me to love, and yet when all was said and done, it left me feeling disappointed, and here’s why. Let’s start with the art style. Now, I can see how the unusual art style might leave some people cold, but for me, this was actually the high point of the game. I found it original, engaging, and beautifully thought out. Unfortunately, playing the game on my 3GS iPhone seemed to do just terrible, terrible things to the graphics, and everything came out looking hopelessly fuzzy and compressed. It just tainted the otherwise lovely art direction of the game. Sound files suffered a similar fate with ugly snap, crackles, and pops interrupting the engaging voicework. 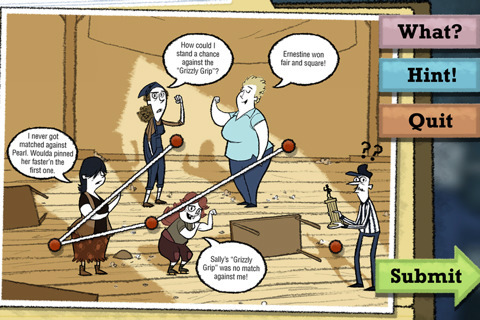 Second, the point-and-click adventure style of the game would have been perfectly fine, if not for the fact that it seems to crib directly from Professor Layton. It’s not the kind of thing that is likely to bother anyone who hasn’t played the Professor Layton games, but fans of the Nintendo DS series may be somewhat disappointed by the carbon copy nature of Agent Tether’s investigations. 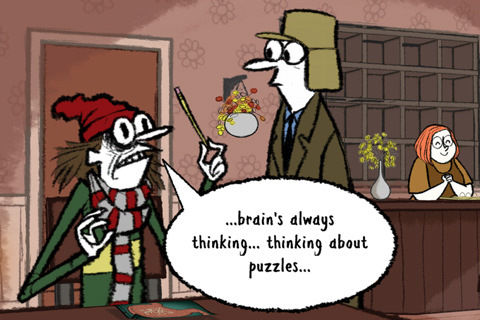 The last and biggest issue I had with Puzzle Agent was the puzzles. They just weren’t very good, and considering that they’re in the title, I was expecting much more. There just wasn’t a lot of variety and so few felt genuinely satisfying that I couldn’t help feeling slightly disappointed by the whole experience. The characters and story in Puzzle Agent are so engaging and distinct, it was such a let down to find that the puzzles didn’t live up to that same high standard. Considering the relatively high price of $4.99, and the sterling reputation of Telltale Games, I expected to find a lot more polish and care evident in Puzzle Agent. I imagine the HD iPad version may have fared a little better on the technical front, although I haven’t played it myself, but it was terribly disappointing to find the iPhone release so lacking. To be fair, it’s not a bad game, and there’s definitely a lot to enjoy about Puzzle Agent, especially with its beautifully fleshed out settings and characters. It has all the makings of a successful series, but future versions will have to put a strong emphasis on making the puzzles more fun if they’re going to seriously win people over. Note: The app is on sale this week only for $0.99. AppSafari review of Puzzle Agent was written by Tracy Yonemoto on October 5th, 2010 and categorized under Adventure, App Store, Games, Puzzler. Page viewed 4153 times, 1 so far today. Need help on using these apps? Please read the Help Page.